To understand how far Hyundai has come in thirty years, one need not look further than the all-new 2015 Sonata. In 1984 the automaker arrived in Canada with the Pony, and then in 1985 added the boxy Stellar II to its range. Lasting only until 1987, the mid-sized Stellar II sedan was replaced late in 1988 with a second-generation vehicle, which Hyundai dubbed the Sonata. Several somewhat frumpy facelifts and model updates later, Hyundai launched the sixth-generation Sonata in 2011. Designed with the automaker’s ‘Fluidic Sculpture’ design language, this car could not be accused of looking stale. In the crowded mid-sized segment, its fresh new looks helped cement the Sonata as a best-selling nameplate for Hyundai. 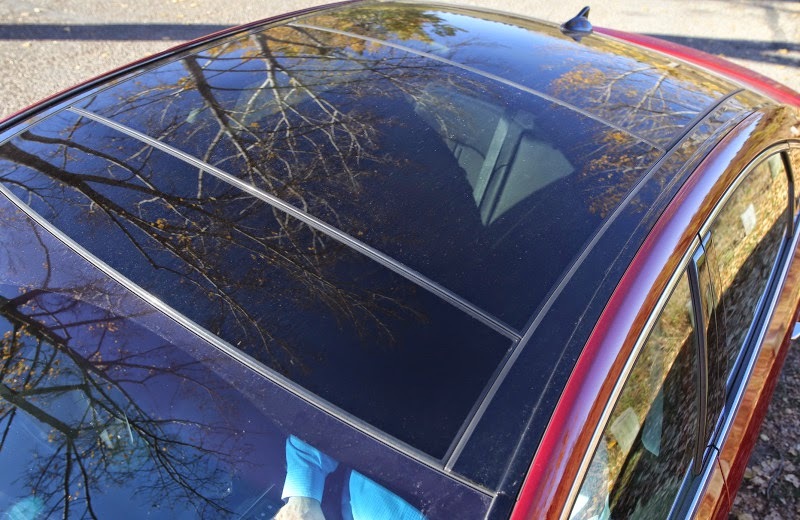 With updated ‘Fluidic Sculpture 2.0’ design language, the 2015 Sonata has been given tauter sheet metal. Essentially, several new features, such as the hexagonal grille surrounded by sweptback headlights and muscular wheel arch flares, redefine the car. Available with either a naturally aspirated 2.4-litre I4 or turbocharged 2.0-L I4, the only choice of transmission is a six-speed automatic. The car is offered in a variety of trims, from base Sonata GL to GLS, Sport, Sport Tech, Limited, Sport 2.0T and Sport 2.0T Limited with Ultimate Package. Prices range, accordingly, from $23,499 to $34,799 before taxes and destination charge. Reader Reviewer Dean Proctor is familiar with the Hyundai brand. 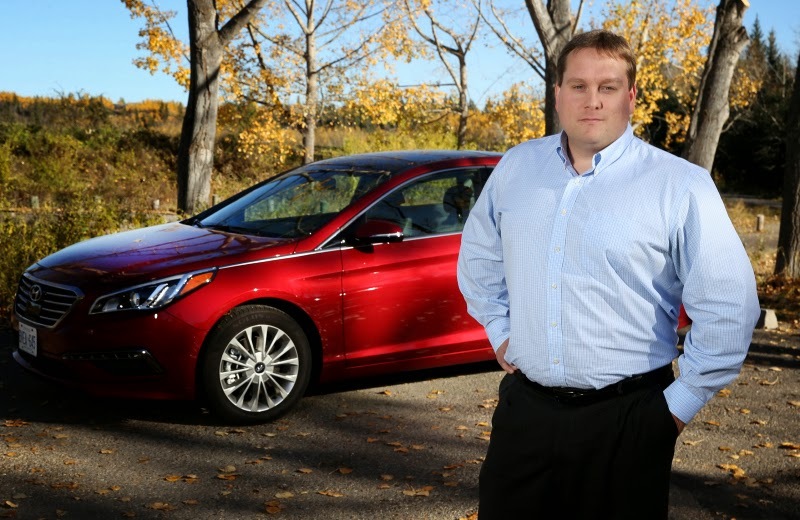 The Calgarian owns two — a 2011 Vera Cruz SUV and a 2014 Elantra GT. His wife Amanda pilots the Vera Cruz, while the Elantra is Proctor’s winter driver. In the summer, he runs a 2014 Camaro ZL1. Proctor had an affinity for Chrysler products, having owned a Dodge Daytona, Dodge Charger, PT Cruiser and Jeep Compass. The Vera Cruz was Proctor’s first non-domestic vehicle purchase. When shopping for a new car, he considers performance (“it has to be able to get out of the way of itself, but it doesn’t need to be the fastest car on the road”), styling (“something that’s pleasing, but I’m also not against having something a bit different”), and value (“I don’t want to pay for a name, I just want to feel that at the end of the day I’m getting what I’ve paid for”). So, how did he feel about the brand-new Sonata? 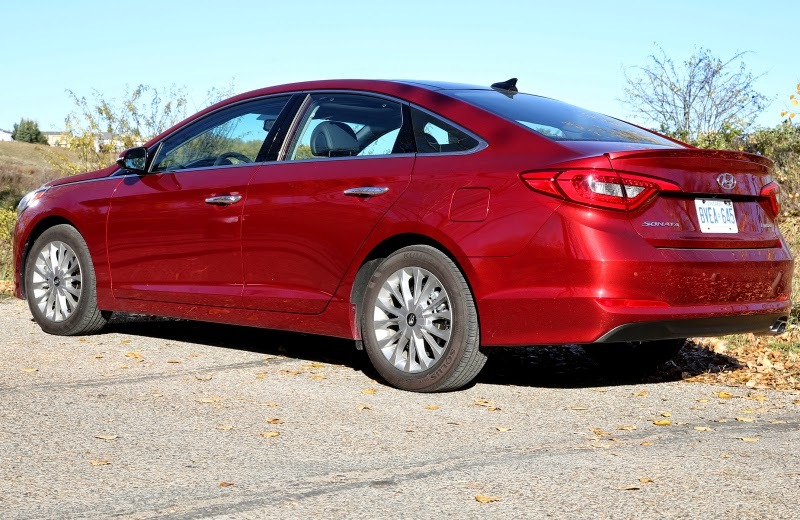 His tester for the week was the 2015 Sonata Limited, finished in Venetian Red with black leather interior. The Limited model adds several safety systems including blind spot detection, rear park assist, lane departure warning, front collision warning and adaptive cruise control. 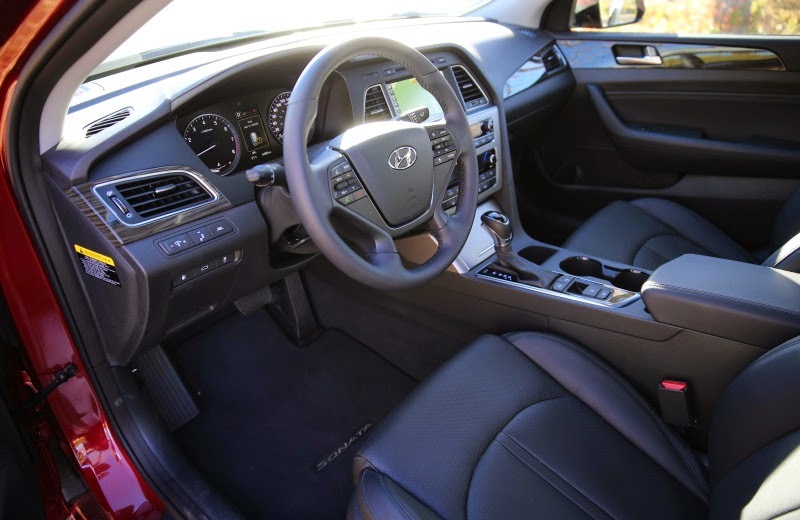 This version of the Sonata also gets an upgraded sound system, windshield wiper de-icer and heated and ventilated front seats and heated rear seats. All-in, Proctor’s Sonata cost $34,694, including destination charge. The Limited also gets 17” alloy rims, but Proctor thought the style of the wheels was a little too pedestrian. Proctor is six feet tall, and he immediately settled into the driver’s seat. “It took only a minor adjustment and I was ready to go,” he says. “The panoramic sunroof brought in plenty of natural light, and it made the interior bright and inviting. Proctor appreciated some of the safety systems, but said if he drove the Sonata on a daily basis he’d be inclined to turn the lane departure warning system off. Performance, Proctor says, was slightly sluggish. “At times the engine just felt like it was working harder than it needed to, and if I were looking to buy one I think I’d want the turbo option,” he says. The 2.4L naturally aspirated engine in Proctor’s Sonata makes 185 horsepower, while the 2.0-L turbo delivers another 60 horses under the hood for a total of 245 h.p. Overall trunk space surprised Proctor, and he thought he could fit four sets of golf clubs with no trouble. The family made one Costco haul during their week paired up with the Sonata, and their purchases included a month’s worth of items. Everything fit in the Sonata with no protest. By the end of the week, Proctor felt he could easily recommend the Sonata. “It’s a good all-rounder, and I think it best suits quite a broad cross-section of people. It’d be good for a family with a couple of kids, for a single professional or for some empty nesters. Day One: Picked up the car this morning and got some early highway driving in on Trans Canada and Stoney Trail. Initial impressions were good, deep cherry metallic looks sharp, nice lines, spacious interior, good quality finishes. Certainly a visual improvement over the previous model, which I had driven on a few occasions when renting vehicles for work travel. When on the highway, especially when merging or passing, found myself wanting a little more power, the turbo engine would likely be sportier. Very comfortable ride, minimal road noise at cruising speeds and good visibility. Day Two: Continue to like the interior, although having some issues pairing my smart phone. The blind spot monitoring system works well and I have never had this feature before, quite like it. Off to a golf tournament this afternoon, really impressed with the ease of access and size of the trunk. Day Three: Drove the car to work, finally got my smart phone paired. Utilized the backup camera to navigate into my parking stall and it worked great. Taekwondo in the evening and the automatic lights are great and dash lights up well, with minimal glare. Day Four: A bit of frost overnight and would love a “command” start to have a warm car before heading to the office. The lane departure system, although a great safety feature, does take some warming up to as the beeping when cornering can be a distraction, but I do get the theory. Day Five: Again a drive to the office and then loaded up the family for trip to Costco. Very easy getting the car seat in and out and my son loves the panoramic sunroof and the rear window sunshades. My wife tried sitting in the back and found the legroom to be spacious and again we really enjoyed the size of the trunk for shopping. Off to Taekwondo again. Parking the car nose in does take a little familiarizing with the length of the vehicle. Perhaps front bumper sensors would be a nice touch. Day Six: Thanksgiving, so we took the car south down the highway to High River to visit family. Took some back roads along the way, to get a better sense of handling and stability. When cornering aggressively, found a bit of body roll, but not bad for a family sedan. Again, assume the sport – tuned suspension in the turbo might feel a bit tighter. Good comments from family and neighbours about the look of the vehicle. Quite liked the adaptive cruise control both during the day and night, seemed better than other vehicles I had driven as it was not as finicky and had more distance settings. The Forward Collision Warning was certainly interesting. First time it engaged was on the highway when a car suddenly changed lanes, automatically applying the brake. Day Seven: Returned the car. Filled up the tank and fuel economy was quite decent, especially as it involved some spirited driving. Overall impression was very good and value for money was considered excellent.